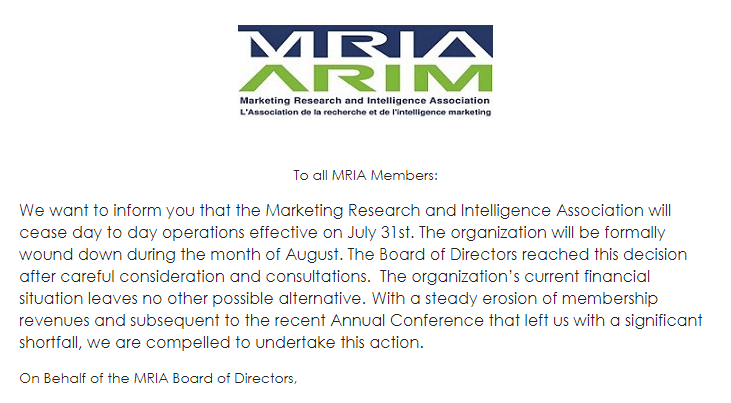 Yesterday, the MRIA, Canada’s marketing research association, emailed its membership to say that it would cease day to day operations effective July 31, 2018 due to its current financial situation. The news has been reported in formal channels including the CBC, the Globe and Mail, and iPolitics, as well as by Research Live in the UK. Reaction has since been heard from leaders of several of the largest research organizations in Canada. We are disappointed to learn this news as the MRIA has worked hard to promote standards and ethics within the market and social research community, and serve as legislative advocates within Canadian and globally. As Gold Seal members, Canadian Viewpoint benefited greatly from their work and we recognize the importance of and need for it. Standards and ethics have always been of utmost importance to our team. With or without the MRIA, we remain committed to providing the same high standards of conduct and quality of service that we always have. Our clients and colleagues can continue to expect our best work as they always have. We are encouraged by the engagement we’ve seen in social media over the last day as people have learned the news and expressed their concerns. It is clear that standards of quality and ethics are important to research providers and buyers in Canada. We look forward to participating in the building and growth of a new association that reflects the needs of researchers in Canada. What are the different types of marketing segmentation? What exactly is the IHUT research methodology? Canadian Viewpoint is an MRIA Gold Seal field and data collection company that specializes in English and French Canada. Our offline and online services include sample, programming, hosting, mall intercepts, pre-recruits, central location recruitment, mystery shopping, site interviews, IHUTs, sensory testing, discussion boards, CATI, facial coding, and other innovative technologies. Learn more about our services on our website. Follow us on Twitter or Linkedin, or sign up for our newsletter! This entry was posted in Market Research and tagged ethics, MRIA, quality, standards. Bookmark the permalink. Copyright © Canadian Viewpoint. All rights reserved.